It's official. 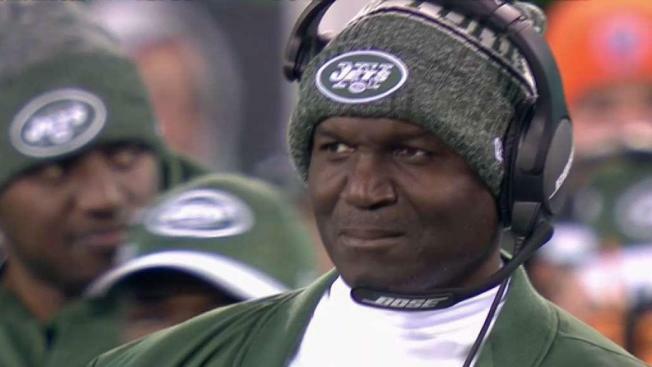 Todd Bowles is out as Jets coach. John Chandler reports. The Jets' search for a new coach is kicking into high gear. The Jets met with Kansas City Chiefs offensive coordinator Eric Bieniemy on Wednesday, and former Miami Dolphins coach Adam Gase on Friday. And, they're far from done with sitting down with candidates. New York is also expected to interview Cowboys defensive backs coach/passing game coordinator Kris Richard in Dallas on Sunday and Tampa Bay Buccaneers offensive coordinator Todd Monken early next week. ESPN reported that Monken will meet with the Jets on Tuesday after interviewing with Green Bay on Saturday and Cincinnati on Monday. McCarthy had a 125-77-2 regular-season record in 13 seasons with the Packers, and went 10-8 in the postseason - including a Super Bowl victory over Pittsburgh to cap the 2010 season. The 55-year-old coach led Green Bay to the playoffs for eight consecutive seasons spanning 2009 through 2016, a streak at the time matched only by New England. Quarterback Aaron Rodgers missed most of the 2017 season with a broken collarbone as the Packers finished 7-9. But, his return this season didn't translate into a postseason appearance - and it ultimately cost McCarthy his job as the Packers went 4-7-1 under him and the team replaced him with Joe Philbin on an interim basis. There were also reports that Rodgers and McCarthy didn't see eye-to-eye on playcalling in recent seasons. McCarthy is perhaps the biggest name among known popular candidates for the Jets, who have failed to reach the playoffs since the 2010 season under Rex Ryan. Whoever comes to New York will be charged with furthering the development of quarterback Sam Darnold, who had an up-and-down rookie season but finished with a solid final month after missing three games with a foot injury. McCarthy has been lauded for his work with quarterbacks, most notably toward the tail end of Brett Favre's career with the Packers and then with Rodgers, who was a two-time league MVP and set several NFL records under the coach's tutelage. McCarthy is a native of Pittsburgh who began his coaching career at Fort Hays State (1987-88) before moving on to the University of Pittsburgh (1989-92). He spent time as an NFL assistant with Kansas City (1993-98), Green Bay (1999), New Orleans (2000-04) and San Francisco (2005) - as the offensive coordinator for both the Saints and 49ers - before being hired as the Packers' coach in 2006.